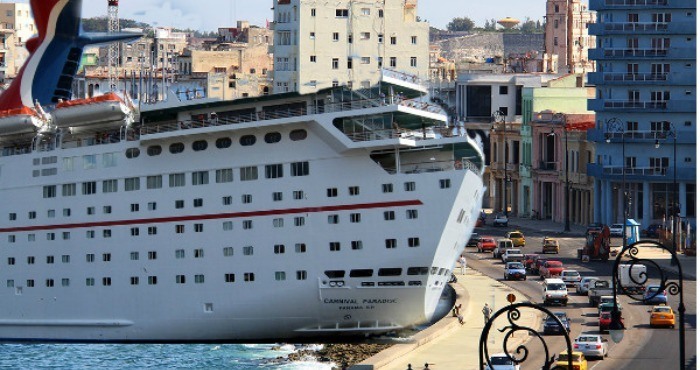 This last weekend, Carnival Cruise Lines unveiled a new ship that does not simply travel to Cuba, but that spans the entire length from the tip of Florida to Havana’s Malecón without actually moving. Stretching 90 miles in length, the Carnival Grande Bonita contains over fifteen all you can eat 24-hour buffets, eighteen pizzerias, and seven hundred and fifty five casinos – all of which they recommend their guests visit at some point on their standing voyage. For safety’s sake, the ship also contains 400 emergency life rafts that are far superior to the rafts Cubans used to make in an attempt to reach the very same coast that is now connected to them by a single cruise ship. “Here at Carnival, we like to say ‘Go big or home.’ That’s what the Carnival experience should be about. But with the Grande Bonita, we say ‘Go big and stay home. It’s the American way,’” said a beaming Carnival representative at the ship’s unveiling. And introduce it they will. The Malecón, a site once known for its picturesque romanticism, is soon going to be known primarily by the jutting, white tail-end of the ship now shoved up against its rocky shore. “We don’t actually expect most travelers to leave the boat, and in fact discourage it, but they can wave at local Cubans from the mall-sized water slide on the upper deck in an act of cross-cultural goodwill,” continued a Carnival spokesperson. At press time, Carnival stated that its main concern continued to be actually getting people to stand up and walk more than twenty-five feet.